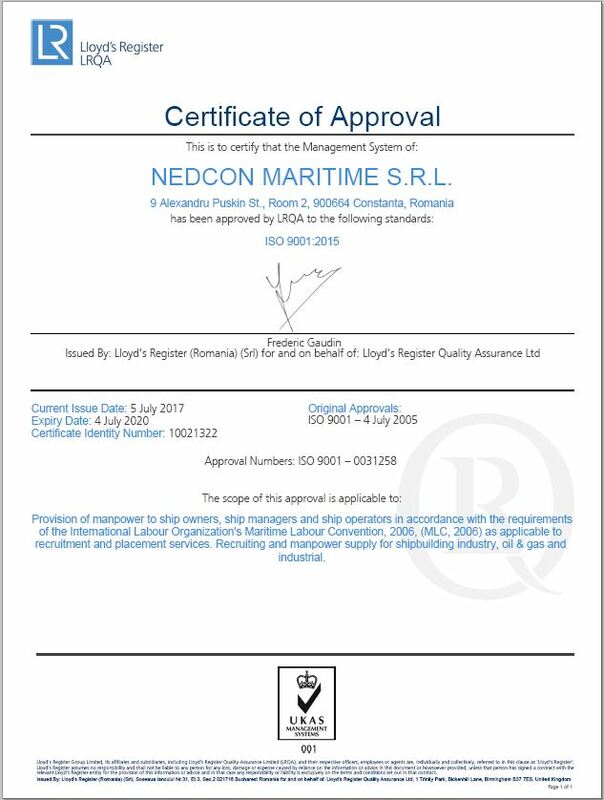 We are proud to announce that Nedcon Maritime has renewed its ISO 9001:2015 Certificate, which entered into force starting with the 5th of July. All the documentation has been updated and improved according to the requirements and the Quality Management System. During the Lloyd’s Register external audit which took place between 26 – 27 June 2017, the revised documentation was checked according with the standard requirements. Nedcon Maritime Manpower is MLC 2006 certified as a “Provision of manpower to shipowners, ship managers and ship operators in accordance with the requirements of the International Labour Organisation’s Maritime Labour Convention, 2006 (MLC, 2006) as applicable to recruitment and placement services. Recruiting and Manpower supply for shipping, shipbuilding industry, oil & gas and industrial”. The final report stated that the NEDCON Maritime Manpower Supply Quality Management System complies with the requirements of the international standard and all the items were passed with success, no unconformities were identified. We thank our team for all their hard efforts to successfully accomplish the recertification.